This project used the frogged yarn from Paris. I wanted something with positive ease for this yarn with lots of nice drape. I also wanted something with a good neckline. I must admit my neckline is a bit bigger than in the pattern, but it’s within reason and I can wear a tank top underneath. It is warm and light. Buttercup, started January 24th 2013, finished March 13th 2013. 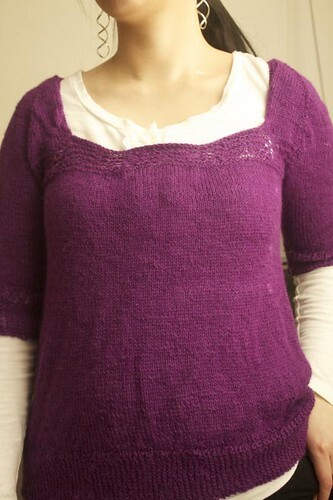 As PiPiBird’s variation on Ravelry: Knit “k4, k2tog” in the penultimate round of body. Knit another round and then did sideways garter rib: CO 14 sts on 3.25mm and knit last stitch with one stitch from the body. Lengthen sleeves to about 36 rows and knit “k2, k2tog” for penultimate row. CO 12 st 3.25mm for sideways garter border for sleeves. Lessons Learned: Sideways garter rib. Cost of Project: Around $20-25 for the 4 skeins I think. Would I knit it again? Doubtful that I would need 2 of these, but this pattern is easy, attractive and appealing especially as written as the sideways garter was fiddly. I recommend it. So, so pretty! And what a gorgeous shade of purple. Looks very elegant paired with a little top underneath it! Thank you, Minding My Own Stitches! I hope to wear it more in the future. Have a good week!